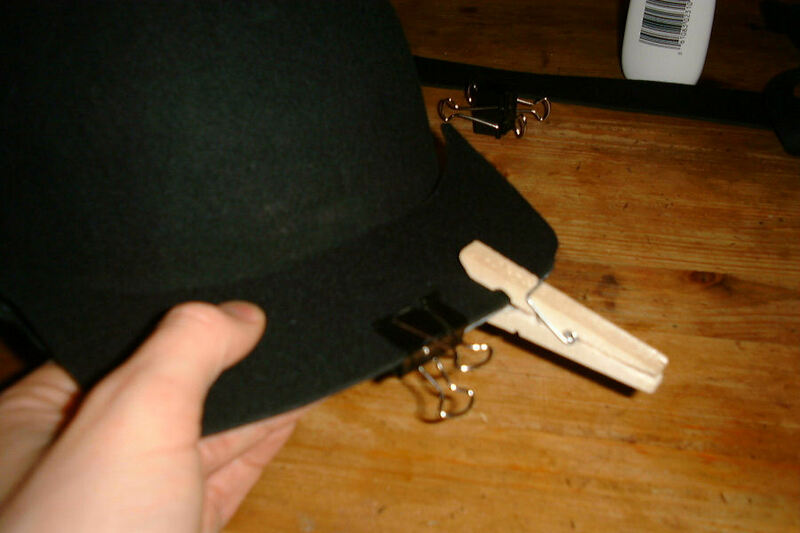 ASSEMBLING THE KRRNY CAP HAT KIT - a step-by-step guide to sartorial glory! Both the 1st & 2nd Battalion KRRNY base their "cap hat" headgear from a variety of sources. In short, the impression for Watt's Coy. Duncan's Coy. and Singleton's Coy. is from a secondary source, first hand account which describes a "..cap with a lock of red horse-hair hanging down one side of it..." From Jeptha. Simms. "Frontiersmen of New York. II" (Albany: 18 , 224-5. W.Y Carman, Journal of the Society for Army Historical Research Vol. LXXI (London: National Army Museum, 1993), 71-72. 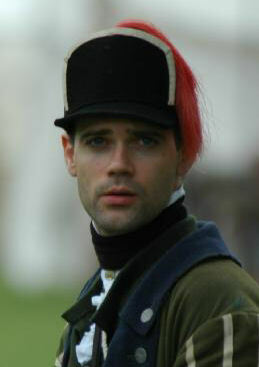 All three sources point to a hat that seems to be a common Canadian department style and which is now employed by the recreated Yorkers. There is evidence to support the idea that both the 1st and 2nd Battalion Light Companies and perhaps the entire regiment, may have been wearing headgear similar, if not exactly as pictured above. As always the research continues. 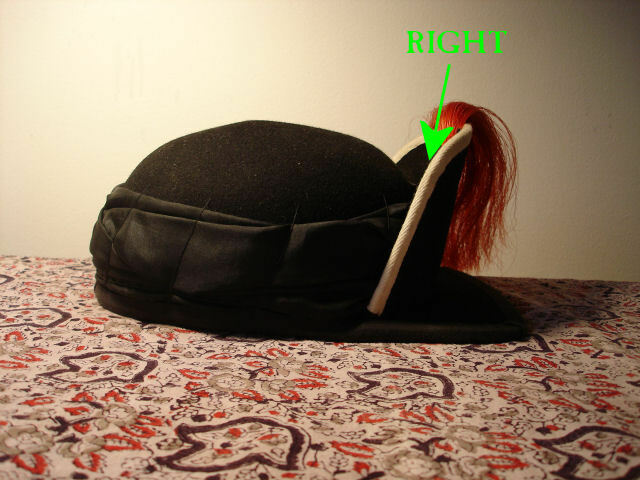 The following is a step-by-step guide as to how to assemble a prefab cap kit. The prefab cap kit is available to members at the cost of materials. 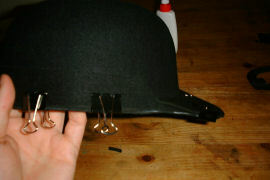 This makes assembly of a cap kit significantly more economical than having the regiment provide a finished cap to you. 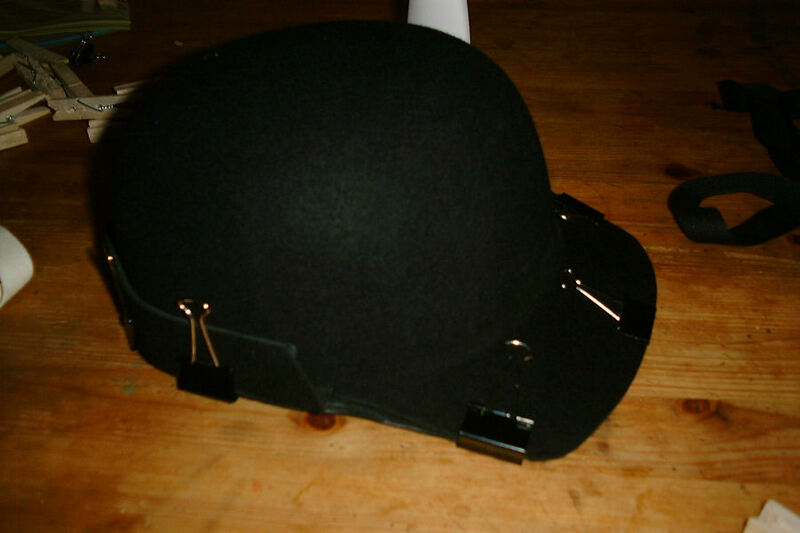 If you would rather not have to go to the trouble of finishing your own cap and you would like to have a finished hat cap supplied to you, contact HQ for prices and availability. 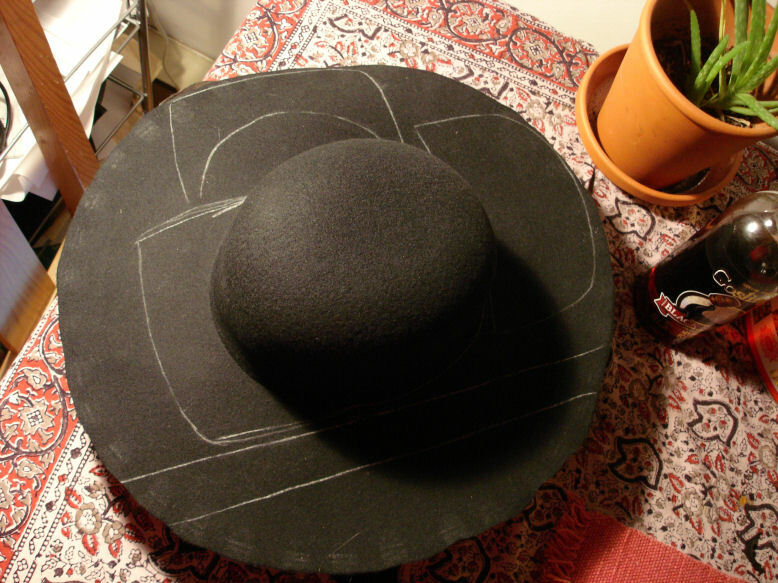 The more adventurous among us can easily make a hat straight from a raw hat blank. All you need is templates, tailors chalk and scissors. The picture to the left shows roughly how you draw out the templates on the brim of the blank. Use the template PDF provided to get the exact uniform dimensions of the shield and visor. For the strip of reinforcement, every brim is different and really all you have to do is draw a rough 1.5 inch strip on the 'longest' part of the brim in order to get your reinforcement piece. 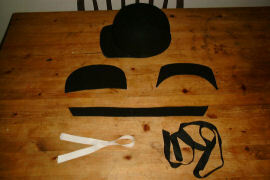 Once you have the templates drawn out on the hat blank, carefully cut out the pieces and trim the edge of your hat crown. You now have a cap kit and are ready to start into stage 2. Before gluing make sure your visor pieces fit to the cap shell properly. You may need to do some trimming to get the visor piece to fit snug to the crown edge of the shell. Don't worry if there is overlap on the outside edge, you will be trimming that part down later. 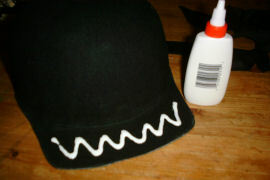 Using regular white glue, liberally apply a criss-cross of glue to the shell visor. Next, fit the visor piece the the visor on the shell. Use a couple of binder clips or clothes pins to secure the pieces together. 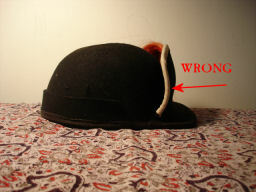 After securing the visor, apply glue around the edge of the cap shell and fit the reinforcement piece all the way around. Use binder clips or clothes pins to secure the reinforcement piece in place. Once you've glued all the pieces in place, let the whole ensemble sit for a few hours so the glue can dry. NOTE: You do not want to wait until the glue is completely dry before you start sewing your lace. Otherwise pushing the needle through hard dry glue will be tough going. Your safe zone for wet glue is about 3 hours. After that things might start to get a little gummy. 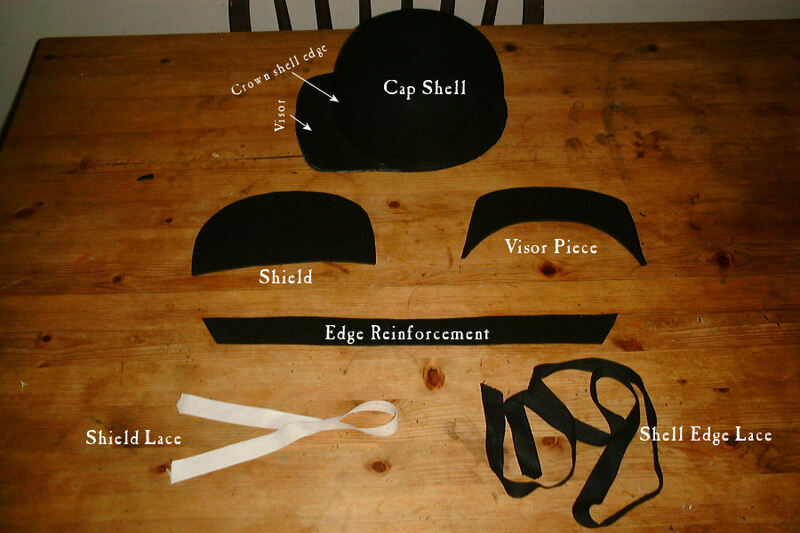 While you are waiting for your cap shell to dry you can sew lace to your shield. 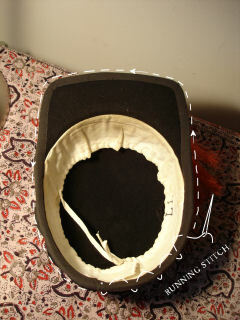 Sewing the shield is as simple as putting a running stitch (up & down stitch) through the lace, directly to the felt. You may want to adjust your lace so that more of it shows to the front of the shield. 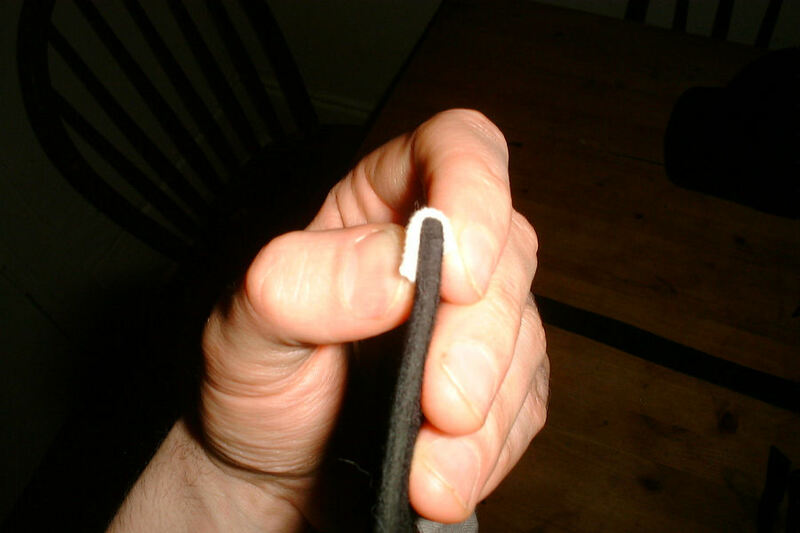 If you do this your running stitch will go in and out at an angle. 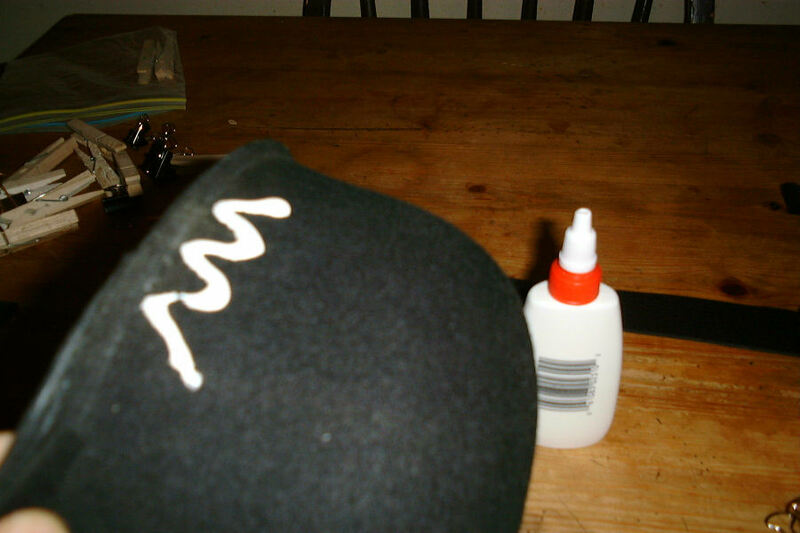 Once your glue is semi-dry, You'll want to take a pair of scissors and cut the visor into the desired dimensions. The visor should be a square at the corners and taper slightly around the front. Visors on the hat cap should be very thin and extend out no more than two inches from the center of the shield / shell edge. 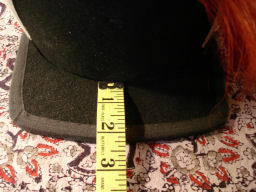 NOTE: the picture to the left shows the measurement after the edge lace has been applied. Make sure you trim before you sew on your edge lace. Once your glue is semi-dry, starting from the very back of the cap shell, apply the lace using a running stitch all the way around the edge of the cap. This process is the toughest part as you are sewing through two layers of felt, glue and lace all at once. It is wise to use a thimble during this process. The Corners of the visor are going to be the trickiest part. Refer to the diagram to the left as a visual aid on how to fold your corners around edges. These folds are also useful on the shield corners. 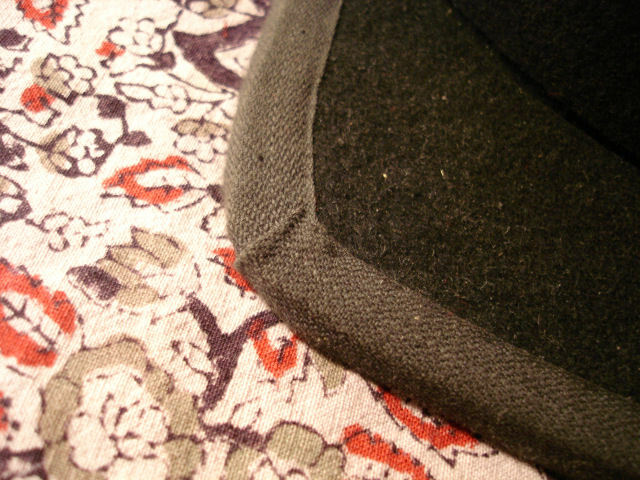 Once you are finished applying the edge lace your hat will be secure and ready to finish. 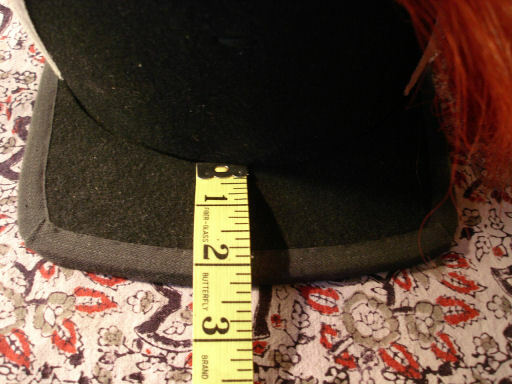 The edge lace is the most important step to giving the whole hat structural credibility. After you have applied the edge lace you can decorate your hat and apply a sweat band. The most important thing to remember about attaching your shield to the shell is that the shield needs to "lean" forward slightly. The slight curve in the bottom of the shield should facilitate this lean. If you sew as close as possible to the bottom edge of the shield you'll get a nice lean. Attach the shield by a running stitch as close as possible to the Crown shell edge. You may want to run this stitch back and forth a couple of times for strength. The more you stitch the firmer your shield will stand. WARNING: This stage of the hat construction is the trickiest part. Be patient and go slow with this one.